Well, if the shortened days, snow, and respectable low temperatures are anything to go by (and I think they are), it would seem that winter is finally here. This means a lot of things. Coffeeshops are switching to peppermint everything, stores are playing Christmas songs to cause a kind of insanity among the public, and, of course, the darker beers are rolling in. Seasonal or not I like my dark beers during the winter. I find that, like a hot chocolate or mug of coffee, these beers add to the experience of warming up by a roasting fire indoors and laughing at whatever poor soul is walking in the snowstorm (don’t judge, I know you do it too). The beers here are just a sample of some of the quality Ontario brews that are coming out right now that go well with fires, sweaters and perhaps a couple of jingling bells. A few of these can also be aged in the cellar for a couple of years, where they will be perfect for sharing with friends, giving as gifts, or used as an emergency escape from family gatherings. 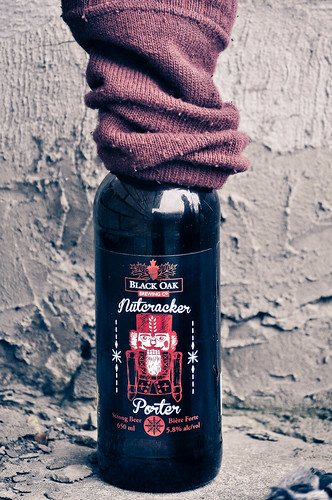 Nutcracker Porter (Black Oak Brewing, 5.8% ABV): The notes of cinnamon and nutmeg in this already make it a winner for what to drink when you just get in from the cold. Pretty intense coffee notes with a nice cocoa finish. Glad that it’s in the LCBO, but it’s definitely a great experience to have on tap. If you’re in the area, Black Oak is hosting a Porter and Pie party at the brewery on December 14th, so you can get a good feel on what food this beer would pair well with. Winterbeard Double Chocolate Cranberry Stout 2012 (Muskoka Brewery, 8% ABV), A beer I always look forward to in winter and this year the folks at Muskoka seem to have done a favour for people who don’t have the space for cellars and aged a batch of last year’s Winter Beard for you with an LCBO release. And it turns out that a year does a lot to the beer, with the cranberry notes rising up slightly and the chocolate notes calming down a bit. As a bonus, if you’re ever near the Brewery off the highway near Bracebridge, see if they have any bottles of Winter Jack left. 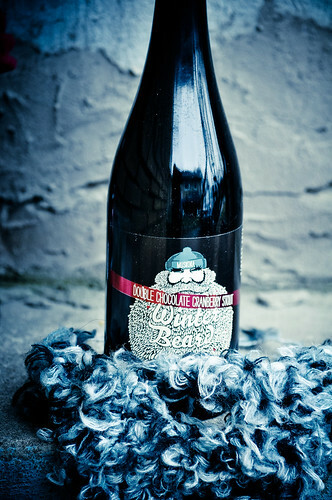 An unforgettable beer that has their 2011 Winterbeard aged in Kentucky Bourbon barrels for a year. Both are excellent winter warmers. Barrel Aged Double Tempest Imperial Stout (Amsterdam Brewing, 14% ABV): This will be making an official launch at the Amsterdam BrewHouse on Saturday at 1pm. A gorgeous beer, but something of a beast at 14%. Really though, that just means you should share this amped up version of Amsterdam’s Tempest or save it for a day when Cabin Fever starts to take hold. Beautiful, rich coffee and cocoa notes with a hint of dried fruit and toffee. The Five Roses Bourbon Barrels that it aged in adds a gorgeous burn to it. A slightly dry finish that rounds things off nicely. Slight aftertaste of chocolate lingers around the taste buds for a while. Vanilla Porter (Mill Street Brewery, 5% ABV): You know, I have really fond memories of this beer. It must have been two years ago in mid-December and I was walking from my work to the Dominion on Queen for a Ukulele jam (I swear, this was before they became a Thing) during a particularly horrible storm. When I finally got in, I was drenched from coat to bone and shivering. Not really knowing what to order, the Mill Street Vanilla Porter hit my fancy and I had one. The sweet chocolaty taste and the warming vanilla extract notes and the creamy head that comes with nitrogen-charged beer can bring made this absolutely perfect. I went back for seconds. And then thirds. Much to my absolute joy, Mill Street finally gave in to the demand and gave it a can release available at LCBOs now. Triple Chocolate Manifesto Triple Chocolate Milk Stout (Flying Monkeys, 10% ABV): I once described their previous effort, the BNL Double Chocolate Imperial Stout as a chocolate cake in alcoholic liquid form. My thoughts on the Triple Chocolate Manifesto are similar to that, only with, yes I’m serious, more chocolate. Made with Cacao nibs and Cacao powder, this beer is almost like drinking a bunch of Brown Cow chocolate syrup. Definitely a sipper to have with family and should most definitely be put on vanilla ice cream. Next Post 2014! New Sights! New Sounds! New Beers! 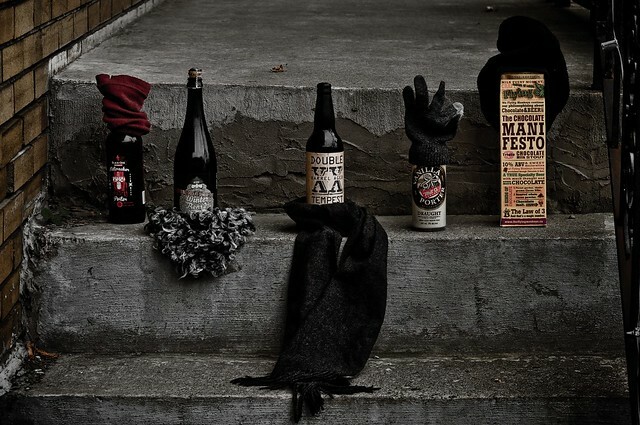 One of my favourite beer bloggers, The Thirsty Wench, offers up her thoughts on some great winter warmers. 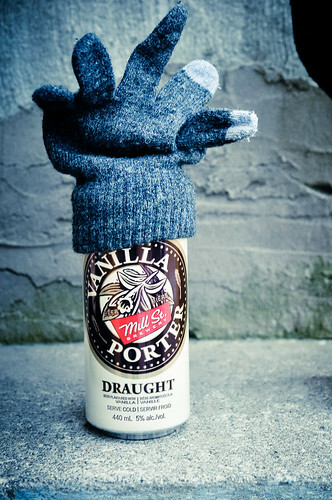 I am thrilled that Mill Street’s Vanilla Porter is available in cans out in Alberta. Such a great beer. Oh man, I know. Really glad that I don’t have to go out to a pub to enjoy it now. I mean, I like going out to pubs, but for the quiet night in, I would want one of these. The cranberry/ chocolate notes in the Winter Beard sound incredible- need to somehow get myself some of this down in Australia just in time for Winter!